After a significant and intense Encinitas City Council meeting last night, I wanted to get the results out to you right away. We decided to send the issue of marijuana cultivation In Encinitas to the voters in the November 2018 election. With a record crowd of more than 300 people — 100 signing up to speak — we voted 4-1 to have the city staff draft an ordinance for the voters to decide whether we will allow marijuana cultivation in our city on agriculturally zoned land. Councilmember Muir, the sole “no” vote, said that he preferred to ban everything marijuana-related outright and not take the local cultivation question to a public vote. At last night’s Encinitas City Council meeting (right), many of those attending and speaking waved signs (left) expressing their opposition to local marijuana cultivation. The left picture shows the Encinitas seal with a marijuana leaf struck out where the poinsettia flower used to be. In the meantime, the City Council is maintaining the status quo, which is a temporary ban on all marijuana activities – dispensaries, growing, manufacturing, and delivery – until the voters weigh in. Encinitas residents passed Prop. 64, which legalized recreational marijuana, by the highest margin in the county at 65 percent. But after several weeks of intense testimony, it’s clear that the specific issue of cultivation remains hotly contested. 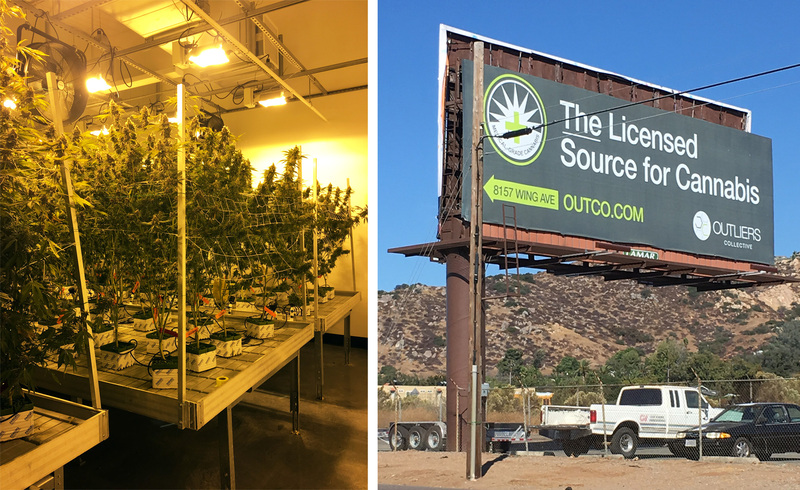 As part of my own investigation of this issue, I visited the first medically permitted marijuana business in the county this week, in an unincorporated area of the county near El Cajon. They grow 750 plants, and have a small storefront that sells medical marijuana supplies like teas, tinctures and lotions, but no edibles. My overall impression of the business was that it was classy, professional, sterile and secure. The plants were grown under lights, in a highly controlled environment with air conditioning and odor control. From the outside, you wouldn’t have had any idea what was being grown inside the warehouse (except for the gigantic billboard, as seen above!). Marijuana is a hot-button issue everywhere, not just here in Encinitas. I personally voted against Prop. 64, largely because I didn’t think we needed more ways to be impaired. However, the voters clearly favored more access to marijuana for recreational and medical reasons. It’s important that I respect the voters’ will and recognize that they have spoken. There is an intensity of feeling and wide polarity of opinions about this culture war. Letting residents decide whether marijuana is cultivated in Encinitas is simply the right thing to do. Because California voters have legalized recreational marijuana, a decision to prohibit local greenhouses from growing it will have no effect on the overall market – recreational marijuana will still be legally consumed in Encinitas. Many people speak to us about the messages we’re sending to our youth. I think it’s useful to look to Napa, where wineries grow grapes. Other areas specialize in hops, as an agricultural crop. In these areas where plants are grown that become alcohol, there is no evidence that youth drink more alcohol. And similarly, I don’t believe that growing marijuana inside a greenhouse, where it can’t be seen or smelled from outside, is going to have any effect on the number of youth who use marijuana. It goes without saying that nobody is in favor of youth access to marijuana (or alcohol). Young people choose to use marijuana, alcohol or cigarettes based on many factors, but I don’t believe a discreet local greenhouse would have any effect on that choice. The debate about whether normalization of this drug is okay or problematic was decided by voters last November when they legalized it. Our farming community is an important element of our city’s identity. I’d like our remaining agricultural heritage to survive, and to do so, growers need to adapt by being able to raise any legal crop. When we have more specifics on the ballot question, I’ll share the details with you. Here’s the San Diego Union-Tribune story.